Incepand de astazi, la chioscuri apare noul numar Pro Motor in care se regaseste testul cu Acura MDX. The interesting thing about Acura's MDX is how muscular it looks. For those of us who have watched Honda (Acura's parent) over the years -- over the decades, really -- it's something of an irony because Honda has always been the brand whose cars were so elegantly designed, made to look light on their feet. I don't use the word "light" lightly -- Honda had about it (and, in many cases, still has) the spirit of Colin Chapman, the famed creator and designer of Lotus cars. Remember the race cars? There was something that connoted a light, but strong vehicle, a car where Chapman had pared away excess weight and unwanted protuberances to make it a lithe and smooth whole. The early Hondas, particularly the Accord line over 30-plus years, always looked lighter and swifter than, say, Honda's arch-rival, the Toyota Camry. To be sure, Camrys outsell Accords in that popular mid-sized sedan category, but the Camrys always looked (and still do) as if Toyota had heaped on an extra 100 or 200 pounds, just to make sure. And how does this apply to the MDX? Honda had its fits and starts in the SUV and minivan business. First, the company did the Honda Passport of the 1990s and early 2000s. It was essentially a rebadged Isuzu and it was not exactly a fine automobile. Acura (Honda's upscale division, which had been around since 1986), in 2001 introduced the MDX, an SUV that capitalized on the then-new trend to put a tall station wagon's body on a sedan frame, something Lexus had done two years earlier with the RX300. It was a smart move. It has all the room of an SUV, but not the bouncy, stiff ride of the truck platform on which most SUVs had been based for years. It has big 18-inch wheels sporting 8-inch-wide tires. It has a thrust-forward, bulldog snout of a grill. It has gracefully flared but substantial fenders. The whole design is one that says, "I'm a strong, tough car, but at the same time don't mistake me for a Suburban or Explorer. I'm more refined." Well, maybe so. The refinement comes in several ways. There's the 300-horsepower 3.7-liter V6, mated to the five-speed automatic with the requisite manumatic facility for when you're bored with being driven by rote. The power train hauls effortlessly and is plenty strong to get this two-ton-plus rig up the on-ramp and onto the freeway with alacrity. You'll hear the engine roar if you mash on the pedal, but it's no louder than any car of this type. Inside -- and it's a plush interior, mind you -- is where things get more interesting. In keeping with the idea that more is better (obverse of the "less is more" theory of design), Acura has made the hands-on control section look something like the dashboard of a Boeing 757. Hmm, if I touch this switch, will the car self-destruct? It's not that this is all bad, but the trend toward sophisticated controls has led, inevitably, to complexity. On the steering wheel of the MDX are 16 different switches. Some of them are dual switches -- the top of the switch does one thing, the bottom another. These controls handle Bluetooth, an information monitor that shows trip mileages, tire pressure monitoring, HandsFreeLink and the like. On the central console, beneath the big navigation screen, are 47 switches, not including the big knob at the bottom that controls a myriad of functions, much like BMW's far more complicated (and heftily criticized) iDrive system. Those 47 switches monitor the rear seat DVD system (is this truly necessary? ), heating and air conditioning, AM/FM/CD controls and the like. I'm not trying to do the Andy Rooney woe-is-me-with-all-these-newfangled-gadgets routine, but suffice to say that you may well spend a few hours with the 470-page owner's manual plumbing the technological depths of this beast before you master all its myriad functions. That aside, the MDX handles predictably well on the road. You know it's big and heavy and it feels that way (once again, it's counterintuitive to the Honda reputation for alacrity), but on the other hand, it's meant to haul people and things. And that it does. 2009 Acura MDX; front engine, all-wheel drive SUV. Power train: 3.7-liter V6 300-horsepower. Five-speed automatic transmission. Fuel consumption : 15 mpg, city; 20 mpg, highway. Length: 190.7 inches; width: 78.5 inches; height: 68.2 inches; wheelbase: 108.3 inches. Warranty: bumper to bumper, four years/50,000 miles; power train, six years, 70,000 miles. Acura's 2009 MDX sport utility vehicle. A substantial near-truck that carries a lot, but loses some of the traditional Honda grace and elegance. Hey, after all, it's not an NSX. See all those switches and buttons? There will be a quiz later on. Surrey, British Columbia - The intermediate luxury sport utility vehicle, with an emphasis on sport, has been a hot commodity in recent years. The competition has certainly grown - even Porsche got in on the action in recent years - but the Acura MDX remains a standout in this class. The original MDX came out in 2001 and received a complete redesign for the 2007 model year. Acura benchmarked the BMW X5 and Porsche Cayenne and tested and tuned the MDX at the famous Nürburgring race-track in Germany. Two cutting-edge technology systems that really improve the performance of the second-generation MDX are its Super-Handling All-Wheel Drive (SH-AWD) and Active Damper System (the latter available in the Elite edition). The SH-AWD system “actively” varies torque distribution between front and rear axles and between the left and right rear wheels. A unique feature of this system is that it can overdrive, or speed up, an outside rear wheel (up to 1.7 per cent faster than the front wheels) to help the vehicle “rotate” around a corner. Acura calls this action “direct yaw control” as it alters the yaw action of the vehicle to allow it to track as the driver intended. It’s a completely automated system that requires no driver interaction and works “in co-operation” with the MDX’s stability-control system to improve cornering traction and steering precision, even on dry pavement. The Active Damper System is actually an electronically controlled “semi active” system that uses fast acting dampers, or shock absorbers, filled with a Magneto-Rheological fluid. The viscosity of this fluid can be changed in as little as five milliseconds (0.005 sec.) using electromagnetic induction. Computer algorithms keep the dampers a step ahead of body movements and allow a more “flat” cornering feel with reduced body roll. Each damper has a wiring coil that can generate an electromagnetic field when current is passed through it and the driver can select a Sport or Comfort setting for the vehicle. Designed in California and built in Canada, the 2009 MDX is offered in Base trim ($52,500) with optional Technology Package ($57,200) or Elite Package ($62,200) and offers seven-passenger seating. The Technology upgrade brings a voice-recognition navigation system, a backup camera, Acura’s 10-speaker DVD-audio sound system, a power tailgate and a premium leather interior. A further upgrade to Elite adds a DVD entertainment system with wireless headphones, a 115-volt power outlet, silver wheels and auto levelling headlights, as well as the Active Damping System. Inside, comfort is optimal in the front seats and the outboard second-row positions. These seating positions are generous in size, with substantial side bolsters and a similar design style. The second-row centre and the two third-row positions are considered occasional use seats and are a more basic design. The twin-cockpit dash is beautifully crafted and an elegant design. Its centre stack, however, has a complex array of buttons plus one of those “big knob” multi-use MMI controllers. Yes, it’s “Honey, can you pass me the manual” time. In my test vehicle, a very comfortable driver’s seat came with 10-way power adjustments and included a power adjustable lumbar support. It also had a two-driver memory system and the front passenger seat was eight-way power adjustable. A unique central storage box sits between the front seats. Its clamshell lid offers individual armrests for driver and passenger. All four doors offer large storage pockets, and there was overhead console storage for sunglasses etc. Premium luxury touches include a three-zone automatic climate control that allows the driver, front passenger and rear passengers to set different temperatures. And in addition to heated front seats, the second-row outboard seats are also heated. There are six possible cargo/passenger configurations for the three rows of seating. With the third-row seats up, there’s 424 litres of storage behind them and when folded flat, cargo capacity jumps to 1,214 litres. Cargo volume can increase to a whopping 2,364 litres if the 60/40 split-folding second row seats are also folded. A heavy snowfall during my time with the MDX drove home the importance of ground clearance in a Canadian winter. While all-wheel-drive is a great feature, that extra under-body clearance, which you get with a truck or an SUV, makes ploughing through deep snow an easier task. The Acura MDX is high on my list of best road-trip vehicles. Comfort, power, safety and performance, it’s got them all. The driving position is excellent and it has good sight lines aided by a big rear window and decently sized side mirrors. Its power tilt and telescopic steering wheel comes with an “easy entry” feature that temporarily tilts the wheel up (out of the way) as you slide into the seat. The perforated leather seating, used in the Elite and Technology trims, is softer and better padded than the base-trim upholstery. The 300-horsepower, 3.7-litre V6 engine is a smooth, quiet and powerful performer, and it’s the same engine Acura also uses in its new RL luxury car. The MDX can accelerate to 100 km/hour in under eight seconds and fuel economy isn’t bad: NRCan’s city/highway rating is 13.8/10.0 L/100 km - but it does like premium fuel. The MDX’s standard all-season tires don’t show-off the SH-AWD system to its full potential during cold temperatures and super slick conditions. Although I did not have any difficulty getting around, I’m sure there would have been less wheel slip had my MDX been shod with winter tires. The MDX has a 2,268-kilogram tow rating and comes with standard trailer pre-wiring, a high-capacity radiator with twin cooling fans, a transmission cooler and Trailer Stability Assist system. All you need is a hitch … and a trailer. The second generation MDX is longer, wider and lower (plus a longer wheelbase) than the original MDX. It is, however, the same weight as the first generation MDX in spite of its extra size and content. Increased use of high-strength steel, aluminum and even magnesium contributed to this achievement. The MDX is a unit body structure, similar to a car, and it incorporates what Acura calls Advanced Compatibility Engineering. In a frontal accident, collision forces are distributed through the structure better, to protect the passenger compartment. The MDX was rated a “best pick” by the Insurance Institute for Highway Safety, based on its front, side and rear crash tests. Its list of standard safety features includes side-curtain airbags for all three rows of seating and front seat active head restraints. The MDX’s sophisticated AWD system assists traction in poor weather, and the MDX is very comfortable and luxurious – but only four of its seven seats are comfortable. Only the nose knows? 2010 Acura MDX ??? Jeff Palmer over at the Temple of VTEC is a Honda/Acura specialist. If you want the latest scoop on the Big H, then you should check out his site on a regular basis. When Jeff checked his e-mail today, he found a couple of renderings of 2010 Acuras from an anonymous tipster. As you can see, the MDX appears to be set for for a TL inspired nose. For comparison's sake, I have placed a photo of the current MDX as an inset into the picture. For a better view of the 2009 MDX, click over to Acura's official website. Jeff also has a picture of what the 2010 RDX might look like. I don't want to steal all of his thunder, so I'll point you over to his post for the actual picture. Standard caveats apply here. These pictures could be total BS for all we know. Acura and Honda won't confirm or deny the veracity of the images. However, even if they were done by some kid with overactive Photoshop skills, it would stand to reason that Acura's crossovers will receive the family schnoz. Don't forget that the MDX/RDX will shortly be joined by the ZDX (shown in prototype form). Road Test: 2009 Acura MDX Tech ! Dejected and discarded like a worn-out pair of chinos, the once magnanimous minivan is fading away in favour of crossovers and SUVs. This is too bad because no other vehicle offers such a bounty of space, utility, decent fuel economy and car-like characteristics. The blame, of course, is not with minivans themselves but with the perception that what you drive is who you are. While there may be a needle of truth to that, countless moms and dads are still turning up their noses at minivans and buying Lexus RXs, BMW X5s, Nissan Muranos, Audi Q7s, Infiniti FXs, Mercedes MLs and Porsche Cayennes, to name a few. All of these vehicles have less interior room and less utility than the humble van, but laying on the charm for today's parents are the SUVs' rugged good looks, all-wheeldrive capability and the message to the world that you're done with all that cryin' and complainin'. So, can an SUV genuinely fill the void of a minivan? As the owner of a Honda Odyssey minivan that has seen more than its share of abuse at the hands, boots and teeth of children, I'm ripe for a new SUV. To find out if an SUV can fill the shoes of a van, I recently long-hauled my two boys, aged eight and 11, and my wife to Myrtle Beach, S. C. and back in a 2009 Acura MDX. Could it replace the minivan that has so stoically made the annual trip in years past? The first question was whether the MDX could swallow all our junk -- two boogie boards, two skim boards, two coolers, three bins, three carry-on bags, toys, coats, scooters, food, games and miscellaneous other items. If we were using the van, we might have added the kids' bikes, but they weren't essential. After some careful loading, repacking and shuffling, all our stuff miraculously fit in the MDX's cargo hold-- with space to see out the rear window even. The middle seats offered plenty of room for the boys, too, and they appreciated having their own window that powered all the way down and their own heated seat. The MDX has a bonus third-row seat that splits 50/50 if needed to seat seven. The boys also enjoyed fiddling with the rear climate system's temperature and fan speed, which would be fine if they were adults. But as kids, the system often needed to be set for them, and I couldn't control the rear temp beyond syncing it with the settings up front, preventing me from sending cool air to the back if they were warm or warm if they were cool. Advantage: minivan. Up front, the instruments and controls seemed numerous and busy at first blush, but after a few days and some familiarity, the layout became more logical. Cup holders are positioned well, there's good storage and the centre gauges are pleasant to look at. Most functions became easy enough to figure out, though a few of the switches were just a tad small for my ageing eyes. Outward visibility was almost as good as the van. Luxury, however, has never been synonymous with minivans and this is perhaps why so many parents are migrating away from them, preferring to pamper themselves with interiors that, like the MDX, embrace luxury. The rich leather, ebony trim and soft rubbers and other materials in the MDX certainly made for real estate more enriching than any van. While I would have liked to have a constant ambient temperature gauge rather than toggling for it (nor could I seem to display instant fuel economy), the cockpit of the MDX is only slightly less roomy than that of a minivan. Ride-wise, the MDX was deliciously smooth, gliding on classy, 18-inch alloy wheels on all-season tires that would no doubt have little trouble dispensing with most cottage trails, where the Super Handling AWD could strut its capabilities. In fact, I found the ride quality to be just right for a family vehicle--firm enough for a sporting ride yet soft enough to keep all the bears happy. Advantage:MDX. Power was neither too much nor too little, and the 300-horsepower, 3.7-litre V6 returned a respectable fuel economy of 11.3 litres per 100 kilometres on the highway under my brisk pace. The five-speed automatic, capable of towing 2,268 kilograms, shifted smoothly enough, but it might benefit from a sixth gear to lower the rpm at 120 km/h from 2,200 and improve fuel economy. Like many of the vehicles in this class, the MDX has a unique look. The wide stance, sharply angled snout and tapered rear give it a beefy presence that belies its gentle comportment. After more than 36 hours behind the wheel of the MDX over 10 days, I was thoroughly relishing the experience, appreciating the quietness of the cabin and its tight fit and finish. The SUV was making sense. Certainly, for my family, the MDX would be a welcome replacement for the van. Transport Canada fuel economy L/100 km: 13.8 city, 10.7 hwy. Noutati: ACC, CMBS, BSI, scaune ventilate, 6 A/T, multi-view rear camera, navi cu hdd si o multime de alte bunatati. Din punctul meu de vedere, cel mai reusit model Acura. Pana acum, vanzarile au demonstrat-o. TORRANCE, Calif. – The award-winning Acura MDX luxury SUV sets even higher standards in 2010 for styling, performance, technology and safety. For 2010, the MDX features a fresh new exterior look, revised powertrain that includes a new 6-speed automatic, chassis refinements, more comfort, and improved technology along with the introduction of an all-new Advance Package— making the class leader even better. "Already considered by many as the benchmark in its class, the new 2010 MDX significantly raises the bar yet again," said Jeff Conrad, vice president of Acura sales. "Fresh looks, an all-new 6-speed transmission and lots of new customer relevant technology make the MDX an even smarter SUV choice than ever." Visually, the 7-passenger 2010 MDX receives more aggressive styling in the form of new front and rear bodywork, a bold new front grille and numerous new trim enhancements. Under the hood, the MDX receives a more refined 3.7L V-6 engine that teams with an all-new 6-speed automatic transmission for better performance and improved fuel efficiency. Inside, the MDX receives a host of new features and technologies that make it even more luxurious. Ride and handling have been enhanced as a result of a revised power steering system, stiffer rear trailing arm mounting, body rigidity improvements and reduced overall NVH. Thanks to Acura’s exclusive Super Handling All-Wheel Drive™ (SH-AWD®) system, the MDX’s handling provides confident on- and off-road handling in addition to excellent foul weather performance. To expand the dynamic capabilities for 2010 MDX, a new Advance package, with a revised Active Damper System and larger 19-inch wheels and tires, further enhances handling while retaining the comfortable, quiet and controlled ride quality expected of a luxury vehicle. The 2010 MDX exterior gets a fresh new look as a result of Acura’s signature design front grille, a new front fascia, revised hood, new side sills, a new rear fascia matched with rolled edge polished stainless-steel exhaust finishers, revised taillights with brighter LED lights, many new trim pieces and available 19-inch diameter 7-spoke aluminum-alloy wheels. 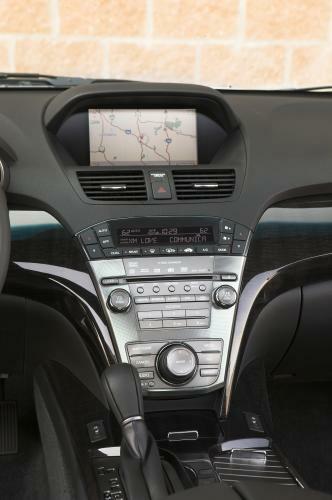 Inside, the 2010 MDX benefits from the expanded use of Milano leather, a new thicker sport steering wheel with racing-inspired paddle shifters, new gauges, easier to understand button placement for center stack functions, available ventilated front seats and upgraded interior trim. In addition, a host of new technology is available including AcuraLink Real-Time Weather™ and Traffic Rerouting™. Other available features include a new full VGA 8-inch navigation screen, a new rear view camera with three unique view choices, upgraded rear entertainment system, an updated audio system with a dedicated 15 GB hard disk drive (HDD) and USB port connectivity, even more LED lighting— and the list goes on. In keeping with Acura’s leadership in the application of advanced, customer-relevant features, the 2010 MDX is available with an array of technologies to improve convenience, including an all-new blind spot information system and Adaptive Cruise Control (ACC), and enhance safety, with Acura’s unique Collision Mitigation Braking System™ (CMBS™). 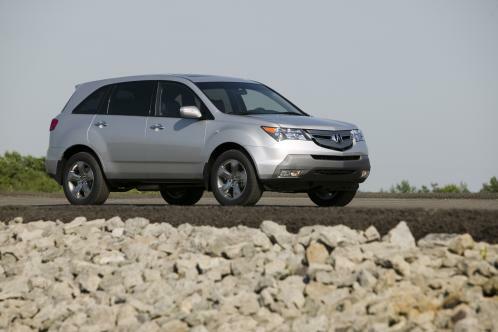 For 2010 the MDX receives a new 3.7-liter VTEC® V-6. The engine continues Acura’s longstanding mission to provide V-8 level horsepower and torque while retaining the size and fuel efficiency of a V-6. Based on the previous MDX’s powerplant, the newly refined 3.7L V-6 develops 300 horsepower and 270 lb-ft of torque to provide immediate throttle response, outstanding low- and mid-range torque and excellent high-rpm power. To widen the powerband while simultaneously improving fuel efficiency, the latest 3.7-liter engine has the patented Variable Valve Timing and Lift Electronic Control (VTEC®) system applied to the intake valves, revised high-lift camshaft specs during VTEC® operation, a computer controlled dual-stage induction system and an electronic Drive-by-Wire™ throttle system. Internally, the new 3.7L V-6 makes use of special heavy-duty components including a more rigid cylinder block, high-strength crankshaft, heavy-duty connecting rods, high compression-ratio pistons, cylinder heads with improved cooling, new intake valve springs, a new EGR system, unique long-reach spark plugs, a larger throttle body and other features. EPA estimated city/highway fuel mileage of 16/21 mpg* (an improvement of 1 mpg city and 1 mpg highway over the 2009 model) and a large 21-gallon fuel capacity mean the MDX is perfect for long drives. Like all 2010 Acura vehicles, the MDX complies with the latest EPA TIER 2 – BIN 5 and CARB LEV II ULEV emissions standards. The 3.7L V-6 is coupled with a brand-new Sequential SportShift 6-speed automatic transmission along with a new multi-clutch torque converter. With comparatively “short” gearing in the first five forward gears, acceleration is enhanced— while fuel efficiency and quiet cruising are optimized with a relaxed Sixth gear ratio. The transmission offers two automatic shift modes, or can be operated manually via racing-inspired steering wheel paddle shifters. Grade Logic Control, Shift Hold Control, Cornering G Shift Control and Hill Start Assist make the new 6-speed the most advanced automatic transmission ever offered by Acura. To support the MDX’s 5,000 pound towing capacity, a special front-mount transmission fluid cooler is employed. The MDX puts power to the ground through Acura’s acclaimed Super Handling All-Wheel Drive™ (SH-AWD®) system, an innovative full-time all-wheel-drive system that uses torque vectoring to actively distribute the optimum amount of power not only between the front and rear axles, but also between the left and right rear wheels. With torque vectoring (and by selectively overdriving the outside rear wheel while cornering) the yaw moment of the MDX can be controlled throughout a turn as the SH-AWD® system reduces understeer to greatly enhance handling precision and ultimate cornering ability. Working in conjunction with the MDX’s standard Vehicle Stability Assist™ (VSA®) with traction control, SH-AWD® provides enhanced power delivery and driver control whether it be on-road or off-road, in dry, rain, snow or ice. The MDX’s 4-wheel fully-independent suspension makes use of MacPherson struts in front teamed with a multi-link rear suspension design that is mounted to a rigid unit body structure with isolated subframes. The front suspension also uses unique hydro-compliance bushings that provide superior ride isolation and chassis vibration control. The rear suspension features aluminum-alloy uprights to reduce unsprung weight for improved response, while special trailing-arm mounting points reduce body squat during acceleration. For 2010, the MDX uses stiffer rear trailing arm mounts, incorporates numerous body rigidity improvements and delivers reduced overall NVH. As part of the available Advance Package, the Active Damper System gives the 2010 MDX an elevated level of handling precision designed to satisfy the most discriminating drivers— all while maintaining a smooth ride. The MDX’s Active Damper System features a new algorithm which provides two driver-selectable settings—Comfort and Sport—that tailor the suspension dampers for a more comfortable or more sporting ride. For 2010, the Active Dampers have been re-tuned for provide a more refined ride for Comfort mode and a more natural feeling Sport mode. Using "active" Magneto-Rheological fluid dampers and predictive computer algorithms, the MDX’s Active Damper System can respond in as little as five milliseconds (0.005 sec.) to individually adjust the damping force of the shock absorbers ahead of actual body movements to provide improved transient handling, road isolation and body control. For 2010, new (lighter) 18-inch diameter 5-spoke aluminum-alloy wheels are standard with 19-inch diameter 7-spoke aluminum-alloy wheels available as part of the Advance Package. For 2010, new attention to detail and added luxury further distinguish the MDX interior. Expanded use of Milano premium leather to the available Technology Package, improved look and feel of interior trim materials, relocated front seat headrests for improved comfort, more detailed leather stitching (such as the Lancia-style stitching on the steering wheel and shift knob), thicker steering wheel grip, increased use of LED interior lighting and revised cockpit controls make it clear that the MDX is focused on the driver— but not at the expense of passenger comfort. The MDX offers a formidable list of standard equipment including items such as a leather trimmed interior, power moonroof, power windows, leather-wrapped multi-function steering wheel, a Multi-Information Display (MID) that allows access to multiple electronic functions, a tri-zone climate control system with humidity control and Bluetooth® HandsFreeLink® wireless telephone interface. For 2010, now standard are steering wheel mounted paddle shifters, an auto-dimming rearview mirror with integrated rear view camera screen and backlit LED instrumentation. Also standard with the MDX is an 8-speaker, 253-watt Acura Premium Sound System that features an AM/FM tuner, in-dash 6-disc CD changer, WMA player, MP3 capability, XM® Radio and an auxiliary jack for connecting personal audio devices. The available Technology Package adds a range of advanced features designed to offer drivers increased connectivity to the world around them along with added driving enjoyment. In addition to using luxurious full-grain Milano premium leather for the seating surfaces, the Technology Package includes items such as the Maintenance Minder™ system. The Technology Package’s Acura Navigation System with Voice Recognition™ system uses a new 8-inch full VGA high-resolution color display positioned high up in the center of the instrument panel where it is close to the driver’s line of sight. A new rearview camera system offers three different rear view angles—normal rear view, wide angle rear view and a tow-friendly top view. With data now stored on a built-in 60 GB hard disk drive (HDD) media storage device, the navigation system now boots up and operates with impressive speed. The navigation system includes AcuraLink Real-Time Traffic™ with a new Traffic Rerouting™ feature that can display up-to-the-minute traffic information including freeway flow, incident, construction and weather related incidents in 77 major metropolitan areas. New for 2010 is AcuraLink Real-Time Weather™ that includes weather radar image maps. The Technology Package also includes a GPS-linked, solar-sensing tri-zone climate control system that automatically adjusts the temperature and fan speed according to the position of the sun. A popular aspect of the Technology Package is Acura’s renowned Acura/ELS Surround® premium audio system featuring a 410-watt Digital Sound Processor amplifier, a 10-speaker surround sound array, along with a built-in 15-gigabyte hard disk drive (HDD) media storage system that allows the MDX owner to download and store about 3,500 songs** for later playback. The Acura/ELS Surround® premium audio system offers DVD-Audio, DTS™, CD, AM/FM radio, XM® Radio, Bluetooth® Audio, along with USB port and AUX jack connectivity. The Advance Package also includes the Collision Mitigating Braking System™ (CMBS™), Adaptive Cruise Control (ACC), blind spot information system (BSI) and the Active Damper System. In addition, the Advance Package delivers 19x8-inch 7-spoke aluminum-alloy wheels and auto-leveling HID front headlights. An available Entertainment Package includes a new Rear Entertainment System (RES) complete with a DVD player, power folding 9-inch full VGA color screen (with 400-percent improved resolution), dual wireless headphones, a wireless illuminated remote control and 115-volt plug located in the center console. In keeping with Acura’s "Safety Through Innovation" initiative, the 2010 MDX provides state-of-the-art safety for its passengers, including the application of Acura’s Advanced Compatibility Engineering™ (ACE™) body structure. ACE™ employs a network of front frame structures that work to absorb and more evenly distributes collision forces throughout the vehicle and also helps maintain the integrity of the passenger cabin in the event of a severe frontal collision. A special frame member located below the MDX’s front bumper is designed to engage the front bumper of a lower vehicle, allowing the bumper systems of both vehicles to attenuate crash energy more efficiently. Numerous standard "active safety" features that help the MDX driver reduce the risk of collision include Vehicle Stability Assist (VSA) along with an anti-lock braking system (ABS) with Electronic Brake Distribution (EBD) and Brake Assist. An additional active safety feature included in the available Advance Package is the Collision Mitigating Braking System™ (CMBS™) which helps the driver reduce the likelihood of a collision by alerting the driver to potential collision situations and activating the brakes if the system determines a collision likely is unavoidable. VSA® has been retuned for 2010 to deliver a 10-percent improvement in performance during hard acceleration on slippery surfaces. Like all 2009 Acura models, the 2010 MDX is covered by a comprehensive 4-year/50,000 mile bumper-to-bumper limited warranty and a 6-year/70,000 powertrain limited warranty. Additional ownership benefits include Acura Total Luxury Care® (TLC®), which provides free 24-hour roadside assistance, concierge service and trip routing. Si SUV-ul Acura MDX vine cu noutati ! Noul SUV Acura MDX primeste un facelift ce include atat un design revizuit, cat si modificari tehnice. Astfel, masina vine cu un exterior reimprospatat, un propulsor nou, o cutie automata cu sase trepte, mai mult confort si o lista lunga de echipari. Vizual, SUV-ul MDX cu sapte locuri primeste un look mai agresiv, un calandru nou si tevi de esapament din otel inoxidabil. Si sub capota avem noutati, si anume un V6 de 3,7 litri ce dezvolta 300 CP, legat la cutia de viteze automata in sase rapoarte. Sistemul Acura Super Handling AWD ramane in echiparea standard. Interiorul MDX se bucura de tapiterie din piele Milano, un volan restilizat cu o alura vizibil mai sportiva, un sistem de navigare de 8 inch, camera pentru parcarea cu spatele, sistem multimedia cu o capacitate de stocare de 15 GB cu iPod si USB. Last edited by tokyodream; 29-07-09, 12:04. Pfua, deci vreau una rau de tot! Last edited by tokyodream; 29-07-09, 19:38.